Optima Tax Relief offers a variety of tax debt relief services such as tax consultation, tax preparation and compliance, tax resolution, and tax settlement and negotiation. Their team consists of highly qualified tax professionals and preparers. Since 2010, Optima Tax Relief has offered a variety of tax debt relief services to consumers nationwide. The Santa Ana, California-based company was founded by two former students of the Wharton Business School, Harry Langenberg and Jesse Stockwell. 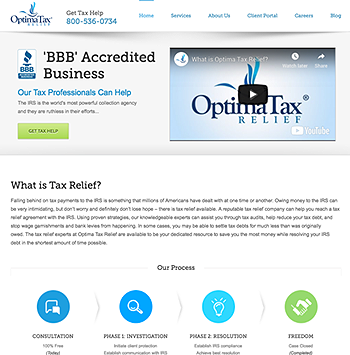 Optima Tax Relief’s team has a highly qualified team of tax professionals consists of over 300 ex-IRS employees, CPAs, enrolled agents, and tax attorneys with over 25 years of combined experience. To get started, interested consumers can contact Optima Tax Relief for a free online consultation, in which they will examine all of your important personal information, such as the amount owed to the IRA, your assests, other debts, and more. Optima Tax Relief will establish communication with the IRS to review your options; this can take anywhere from two to four weeks. Once a solution has been reached, Optima Tax Relief will work to resolve your debts, which can take anywhere from three to nine months. Optima can reduce your IRS tax debt by having their tax experts examine your past tax returns or any unfiled tax returns. They may also provide additional assistance by helping you apply for the IRS Fresh Start Program, which can help those struggling to pay off their federal income tax. Optima Tax Relief can negotiate one of two options for IRS installment agreements -- formal and informal agreements. A formal installment plan is a written agreement for a monthly payment plan between the taxpayer and the IRS; an informal installment agreement allows the taxpayer to make monthly payments and completely pay off their balance in two years. They can also negotiate a compromise with the IRS to help the taxpayer receive a lower and much more affordable tax debt. Accredited service: Optima holds several accreditations, including the NATP, NAEA, and an A+ from the BBB. Award-winning service: Optima Tax Relief has many awards, including being ranked the #1 Financial Services Company Inc. Magazine, the BBB Torch Award on Business Ethics for 2017, OC Register’s Top Workplace, the OC Civic 50 Award (which recognizes the top 50 charitable organizations in Orange County), and is listed by the IRS as an approved Continuing Education Provider (which means they are certified by the IRS to provide educational courses to professions in the tax preparation field). Nationwide service: Optima is licensed to provide their services in all 50 states by the IRS. Free consultation: Potential customers can receive a free consultation over the phone. Great customer service: Customers stated that Optima Tax Relief provided great customer service, thoroughly explained the tax relief process, and saved them thousands of dollars. Money back guarantee: Optima Tax Relief offers a 15-day money-back guarantee for all of their tax services. Licensed staff: Optima Tax Relief has licensed CPAs, enrolled agents, and tax attorneys on staff. Optima Tax Relief is a fairly new tax relief company and does not have as much experience as some of its competitors. Some customers stated that the fees charged by Optima Tax relief were too high. Optima Tax Relief’s full list of fees is difficult to find on their website. Potential clients need to contact Optima directly to learn more. Optima Tax Relief requires a minimum debt requirement of $10,000. They offer a 15-day money back guarantee for any fees paid during Phase One, or the Investigation Phase. Optima’s pricing depends on your unique situation. Their services start at $495 and can go as high as $23,000. However, most consumers will pay fees between $3,000 and $5,000. Tax relief is a broad term that covers a variety of services created by the IRS and State taxing authorities, such as debt reduction, penalty abatement, and even interest reduction for businesses and individuals. Optima Tax Relief can work with nearly all tax issues that consumers may struggle with. Yes, but it can be much more challenging to pursue it on your own. Tax relief services like Optima Tax Relief have knowledgeable and licensed agents who have years of training and education. Does Optima Tax Relief’s staff provide in-house services? Yes, all of their tax relief specialists are employed by Optima. Their licensed and certified specialists include tax attorneys, enrolled agents, and CPAs.